We think the darker brown egg belongs to our Black French Copper Marans, Loretta, and the lighter one to our Dominique, Nellie. Two eggs in one day? That’s how our first special delivery arrived this evening. As soon and Matt and I got home from work, I went out back for my daily egg check. I wasn’t really expecting anything; the last two weeks had come up empty every time. And then I saw it. Nellie’s light brown egg in the far right nest box. As I steadied myself, my eyes glanced over to the left nest box, … and there sat a second egg! Both are small, about half the size of an extra large egg. But they are easily identifiable. Loretta, a Black French Copper Marans, will eventually lay dark chocolate brown eggs. The one she offered today is still on the light side, but her eggs will quickly darken up. 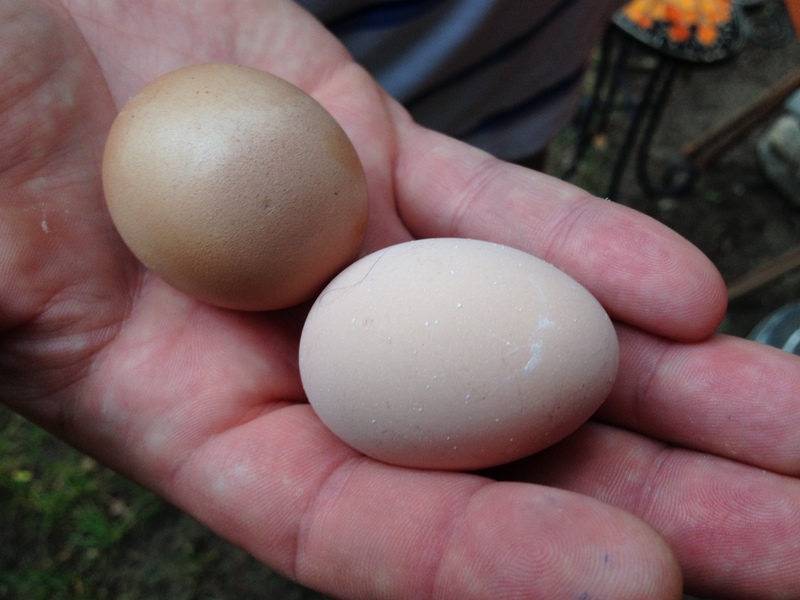 And since Gigi, our Olive Egger, will lay green eggs, it was easy to deduce who left the second lighter brown egg. After handing the day’s bounty off to Matt, I grabbed a handful of scratch and threw it into the run. “Well done, girls!” I said, as they eagerly pecked away. We don’t have quite enough for an omelette, but Matt and I will have a special celebratory snack tonight! ← Week 17: Prepping for eggs! I was thinking about you and your girls today thinking, haven’t heard about eggs yet. Lol! That is so cool. Congratulations. My babies are a week old yesterday are are doing great! Thanks so much! And I’m so happy to hear about your babies. They are so sweet when they are just little babies!